We have been asked if the floods in Ontario & Quebec are affecting us. The answer is “yes” and “no.” “No”‘ because there are no raging rivers rushing into homes and properties here but “yes” because there is far too much water. Lake Ontario was already very high and, on top of that, we have had nearly 6 inches (150 mm’s) of rain in the past 6 days. Here are some pictures of the results taken this afternoon. The heavy rains stopped late yesterday so some of the worst had eased a bit by the time I took these this afternoon. Lake Ontario shoreline from just across the road from our farm. 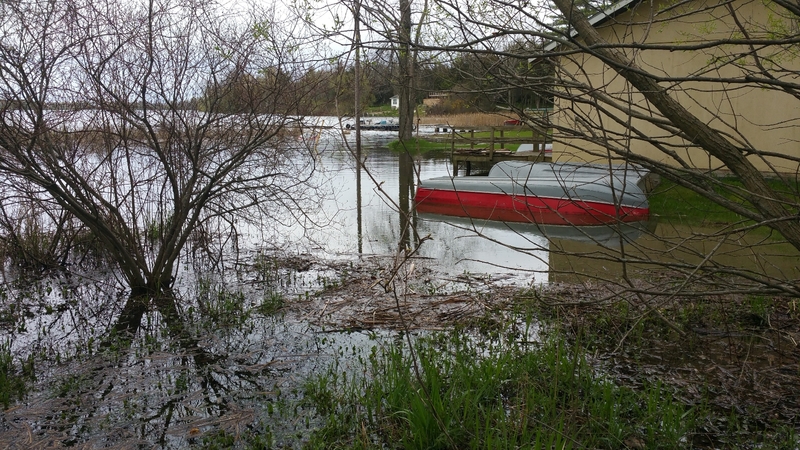 The water is partially surrounding and touching the yellow rental cottage. Most of the foreground was lawn. 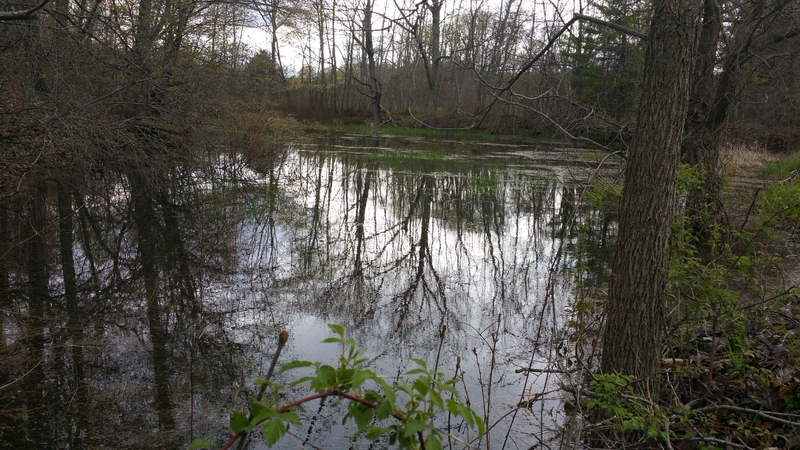 Immediately across the road from where the previous photo was taken, is our wet land that the grandchildren call “the frog pond.” Old timers tell us that it used to be part of the lake and it appears to be part of it again, at least for now. The lake began backing up through the culvert under the road in the past few weeks and when all the rains came this past week, there was nowhere for the runoff to go so the “frog pond” filled even more. 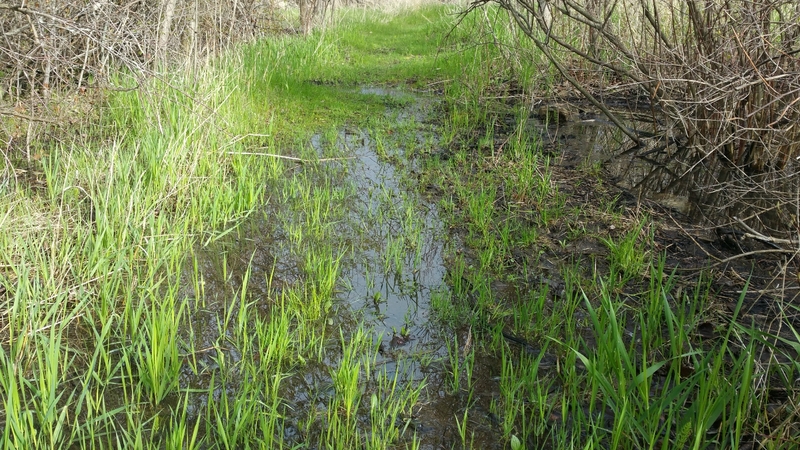 Our land is very wet, especially the areas with clay soil. 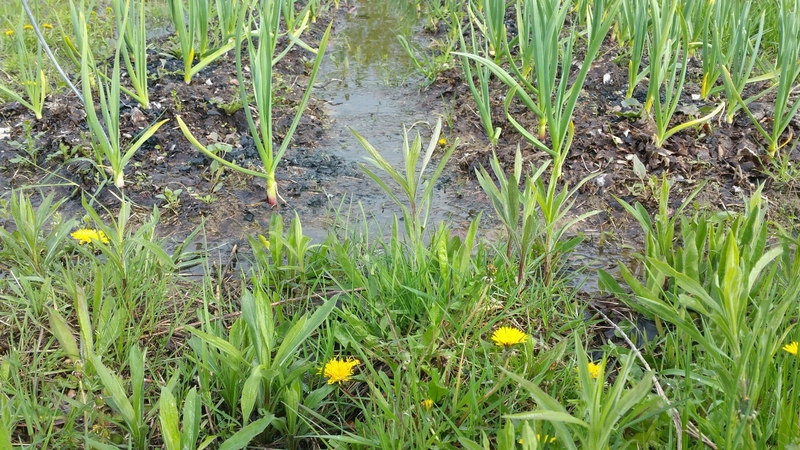 Here one of Andrew and Colleen’s garlic patches planted last fall is partially under water. The main trail running the length of the farm from our house to Andrew and Colleen’s house, which was used as a “tractor lane” years ago, is almost impassable in places if one doesn’t have high boots. 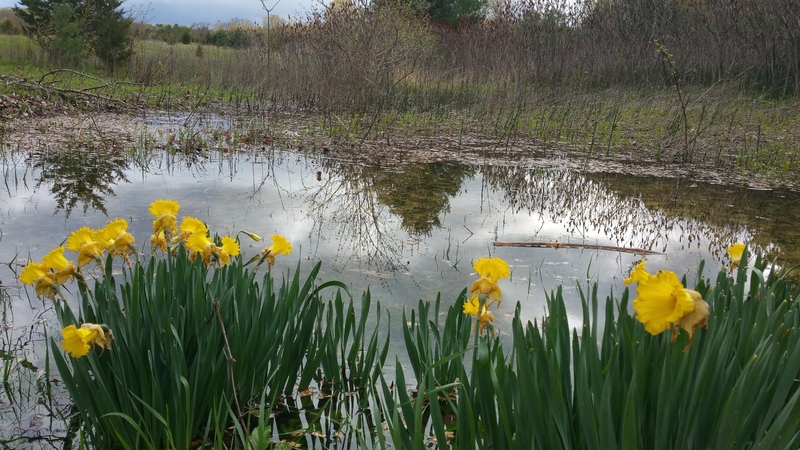 The far north-east corner of the farm, usually a dry area, now contains a small lake. The daffodil bulbs probably arrived many years ago when cottage owners across the road (on which I was standing when taking the photo) dumped their yard waste on the road allowance. Regardless of how they arrived, we do enjoy the flowers. Last year at this time the drought had begun and our “duck pond” at the front of the house was drying up. This year, however, it is fuller than we have ever seen it. It is now up to the edge of the driveway and running out around the rock pile. 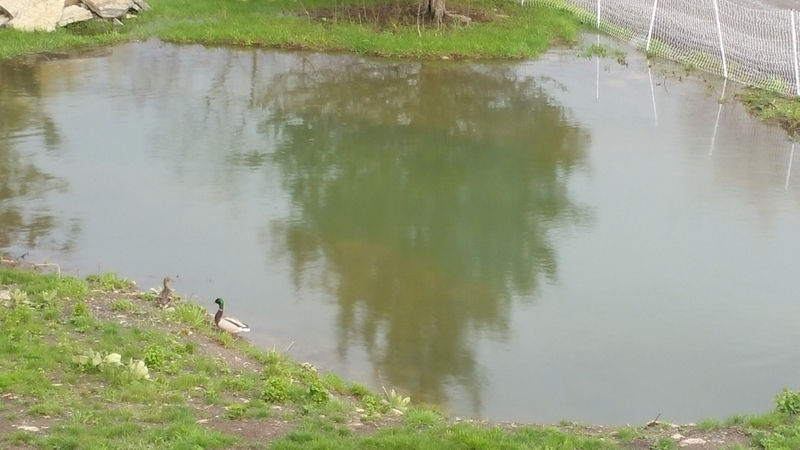 We have enjoyed a pair of mallard ducks (left foreground) which has spent time in the “duck pond” nearly every day. Sometimes they are joined by several other male mallards. We have not seen a nest and can’t tell if they are getting anything to eat from the bottom but they do seem to enjoy spending quite a few hours there each day. Our hope is that some of all of this water is making it down into the ground water, helping to ensure a good supply in everyone’s wells this summer.